A data-based study about the evolution and adoption of electronic payments across CEE countries vs. EU28. Card payments are gaining ground in CEE countries. And that's a data-proven fact! How have card payments developed through the years? What affected the rise of POS terminals in the past 5 years? How does EFT-POS terminals and cards penetration look like now in Europe vs CEE? What is “the next big thing” that banks should be focused on? 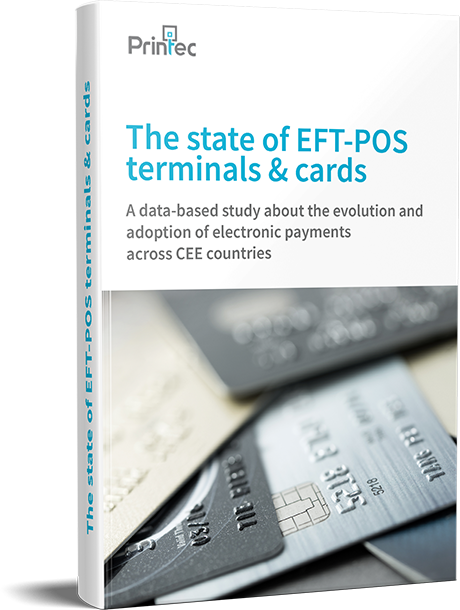 Get your fair share of knowledge by downloading and reading our latest report about The state of EFT-POS terminals & cards - a data-based study about the evolution and adoption of contactless payments across CEE countries vs. EU28. This is a Printec created whitepaper based on pre-existing reports, aiming to present in brief how EFT-POS terminals & cards penetration have been formed across CEE countries we call Printecland and how the region, as well as each country compares to EU 28 average.